On Canada Day it seems appropriate to call attention to a collection of stories by a Croatian born writer who immigrated, first to the US where he lived and taught for many years before moving to Montreal in 2009. He decided to settle here, and is now a Canadian citizen. Josip Novakovich is a master of the short story and his tales tend to stretch across borders, typically either stepping back into, or at least glancing at, his Balkan homeland. 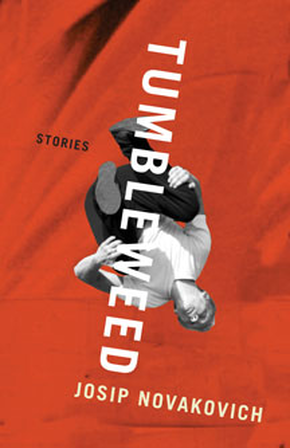 Yet in his latest collection, Tumbleweed, the majority of the stories are set in North America, in cities and rural locations where his migrant narrators are struggling to set down roots and build lives for themselves, often in the company of some unforgettable non-human characters. It’s a great introduction to an author with a respected international reputation who deserves to be better known here in his adopted home. My review of Tumbleweed can be found in the latest issue of The Rusty Toque. I’ve got a copy of his Infidelities: Stories of War and Lust – I think I bought it when he was nominated for the Man Booker International? That could be. I have a few of his books that I’d been meaning to read and that influenced my choice of this new title for this review. I’m looking forward to finally getting to the others, he has been on my radar for some time.